Evidence-based practices improve intensive care unit (ICU) outcomes; however, changing behaviors to improve care quality can be challenging in ICUs where diverse clinicians provide care to patients defined by hospital location rather than disease and in community hospitals where few resources may be available for quality improvement. 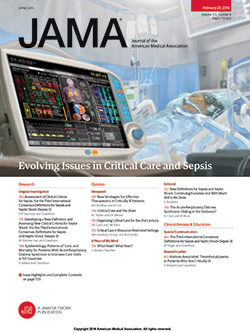 In a cluster randomized trial that involved a collaborative network of 15 geographically dispersed community hospital ICUs in Ontario, Canada, Scales and colleagues Article assessed whether a videoconference-based intervention that included audit and feedback, expert-led educational sessions, and dissemination of algorithms would increase delivery of 6 evidence-based ICU practices. The authors found that the multifaceted quality improvement intervention was associated with improved adoption of evidence-based care practices. In an editorial, Curtis and Levy Article discuss ways in which this investigation advances the science and politics of quality improvement. Hospitals designated as primary stroke centers meet specific infrastructure and organizational criteria that facilitate the rapid diagnosis and treatment of patients with stroke. Although stroke centers are widely accepted and supported, little is known about their effect on patient outcomes. In an analysis of New York hospital data from patients with acute ischemic stroke, Xian and colleagues Article examined the association between admission to designated stroke centers and mortality. The authors found that compared with admission to a non–stroke center hospital, admission to a stroke center was associated with modestly lower 30-day all-cause mortality. In an editorial, Alberts Article discusses the evidence that stroke center care is associated with reductions in stroke-related mortality. Stroke is a potentially preventable complication of coronary artery bypass graft (CABG) surgery. To better understand the timing, risk factors, and outcomes of stroke associated with CABG, Tarakji and colleagues examined preoperative, operative, and postoperative data from a consecutive series of 45 432 patients who underwent primary or reoperative CABG at 1 academic medical center from 1982 to 2010. Among the authors' findings were that the occurrence of stroke declined during the years of study despite patients' increasing risk profiles, and more than half the strokes occurred postoperatively (after emergence from anesthesia) rather than intraoperatively. Sarcoidosis, a multisystem granulomatous disorder that most commonly involves the lungs, skin, and eyes, can also manifest as neurological disease, cardiomyopathy, hypercalcemia, and renal failure. Iannuzzi and Fontana present the case of a woman who had biopsy-confirmed sarcoidosis and was treated with 2 courses of oral prednisone; 6 years later she sought care for progressive fatigue, cough, and dyspnea on exertion. The authors discuss the clinical presentation and diagnosis of sarcoidosis and summarize new findings regarding its immunopathogenesis and the efficacy of novel therapeutic agents. A growing body of basic and early clinical research suggests that it might be possible to improve some of the cognitive and neurologic disabilities associated with fragile X and Down syndromes through drug therapies. Join Steven J. Jacobsen, MD, PhD, Wednesday, February 16, 2011, from 2 to 3 PM eastern time to discuss herpes zoster in older adults and the risk of subsequent herpes zoster disease. To register, go to http://www.ihi.org/AuthorintheRoom. Dr DeAngelis summarizes and comments on this week's issue. Go to http://jama.ama-assn.org/misc/audiocommentary.dtl. For your patients: Information about sarcoidosis.